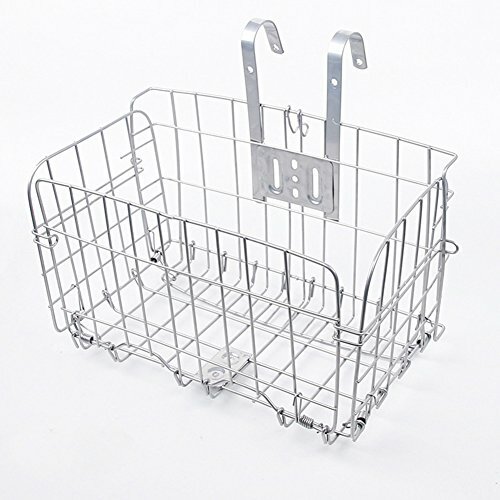 Features: A durable basket that is applicable for bicycle/mountain bike/folding car/commuter car, etc. --The metal surface is specially treated, anti-scratch, anti-corrosion and not easy to rust. --A pair of 1.5cm width hooks with 4 rubber hoses are attached to the handlebars to increase the force area. --Durable steel wire material, eco-friendly, anti-deformation, and with strong load capacity. --Two wire springs on each side of the folding side. The hook design makes it easy to fold and store. --Applicable for bicycle/ mountain bike/ folding car/ commuter car, etc.